What It’s About: A group of college students go on a trip to an isolated cabin and get far more than they bargained for. Why Watch it Today? : The diary Dana (Kristen Connolly) finds in the cabin’s basement mentions today’s date, April 4th. 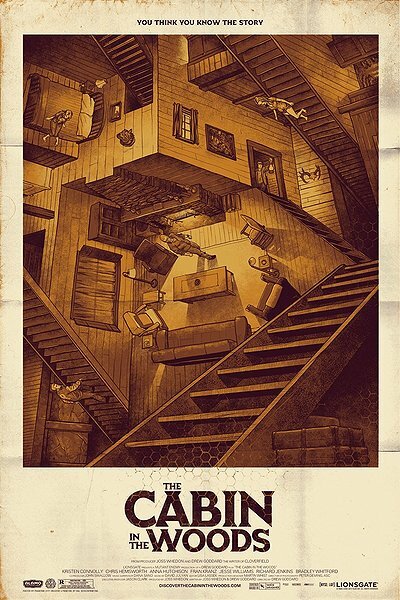 The Cabin in the Woods is a fun horror film and satire of the horror genre, especially the “spam in a cabin” sub-genre. To say anymore would spoil the fun. This entry was posted in Comedy, Cults, Degenerate Hillbillies, Ghost, Horror, Killer Dolls, Killer Kids, Mad Scientist, Monster, Movie of the Day, Mystery, Satire, Slasher, Spoof, Stoner, Werewolves, Zombies and tagged "spam in a cabin", Amy Acker, archetypes, Bradley Whitford, cabin, children of famous people, Chris Hemsworth, college students, cult leader, cultists, Drew Goddard, drugs, Final Couple, final girl, homage, it's not over, Joss Whedon, mind control, paramilitary group, rednecks, Richard Jenkins, sacrifice, scientists, Sigourney Weaver, stoners, twist.